Researchers may have found a way to make traditional light bulbs more energy efficient. Scientists at MIT and Purdue University have created a new recycling technology involving incandescent lights that enables this type of light to be more energy efficient. These warm glowing conventional light bulbs, which were first commercialized by Thomas Edison, have fallen out of favor over the past several years because they are far less efficient than compact fluorescents and LEDs. However, researchers have created a super-efficient two-stage incandescent bulb that reuses the heat it emits, allowing it to convert the heat into additional light. Over 95% of the energy that goes into incandescent bulbs is wasted. One of the major problems of these bulbs is that the vast majority of the energy that goes into them (more than 95%) is wasted and most of the energy is wasted as heat. This is one of the main reasons why countries across the globe have banned these lights or are phasing them out. The bulbs simply do not make practical sense in societies seeking to save energy. 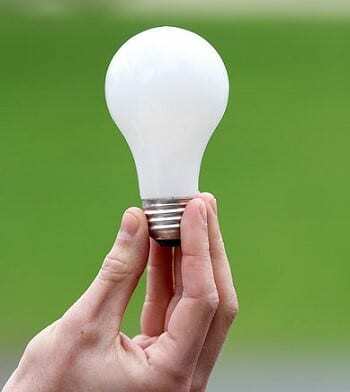 That being said, the scientists at MIT and Purdue University may have found a way to improve the practicality of incandescent light bulbs by reusing the energy that would have otherwise been wasted. The new recycling technology could dramatically improve the luminous efficiency of incandesents. According to the findings of the researchers, which were reported in the journal “Nature Nanotechnology,” a key part of developing the technology involved the creation of a two-stage process. The first stage involves a traditional heated metal filament. However, instead of allowing the waste heat to disperse as infrared radiation, secondary structures (a form of photonic crystal) surrounding the filament capture the radiation and reflect it back to the filament. This allows the radiation to be transformed into visible light by being re-absorbed and re-emitted. That being said, the first proof-of-concept incandescent units developed by the scientists have yet to reach such a high level and have only achieved approximately 6.6% efficiency. Be that as it may, the team also points out that their preliminary results already match the efficiency of some of today’s LEDs and CFLs.